Simple Charm On Big Squam Lake. Get away from it all at this quiet home! 1960's A-frame on the tip of Center Harbor Neck. Set in the woods with amazing Golden Pond sunsets. Sandy beach with crystal clear water. Views of Rattlesnake and surrounding mountains. Read on the dock. Take the canoe out for a paddle. Use the Sailfish on a breezy day. 2 bedrooms sleep 5. Can sleep 7 with day beds/sofas on main floor. 2 full baths. Steep stairs. Full kitchen including mircrowave, gas oven, toaster oven and coffee maker. 2 decks overlooking lake. No neighbors on either side. No internet. No television. Quiet, peaceful, and charming. Note- only for rent in summer months. Parking for 4 cars max. No pets and no kids under 6, please. My grandfather purchased land on Center Harbor Neck nearly 100 years ago. He gave the piece where this house is located to my father, who designed and built the Tall Pine Teepee in the late 1960's. I've come to Squam each of my 53 years, and introduced my husband and daughter to its wonders. We cherish our quiet time here, and hope you will, too. If you know Squam, you know that the tip of Center Harbor Neck is an ideal location on the lake. We have a Western exposure for all day sun. Ten minute drive to Center Harbor for supplies. Quick run to Holderness to get boat gas. Perfect view of the mountains. Sunset views from the house and dock. Quiet location. .
12 acres of woods surrounded by conservation land. Crystal clear Squam waters with a sandy bottom. Visits to and from loons. Great swimming, boating, fishing. Nature all around you. One full bath on each level. Upper level bath features a shower, lower level has a tub. At the tip of Center Harbor Neck on beautiful Squam Lake. Local calls only, or use a calling card. Verizon cell service generally good. Please bring your own towels for the lake. Bed and bath linens provided. Bath towels provided. You should bring beach towels. 3 story living room with windowed wall on front of house. 4 daybed couches make for extra sleeping quarters or comfy places to read/nap/watch a movie. Toaster oven plus regular toaster. Basic spices, plus sugar and flour. Fully equipped kitchen. Gas stovetop and oven. Microwave, coffee maker, toaster oven. No dishwasher. Large table seats 8-10 comfortably. Basic board games (Parcheesi, Monopoly, etc.) in drawers of dining room bench. Some lake toys available- floats, goggles, etc. Canoe provided for your use. Sailboat provided for your use. Winona Golf Course is about a 15 minute drive. 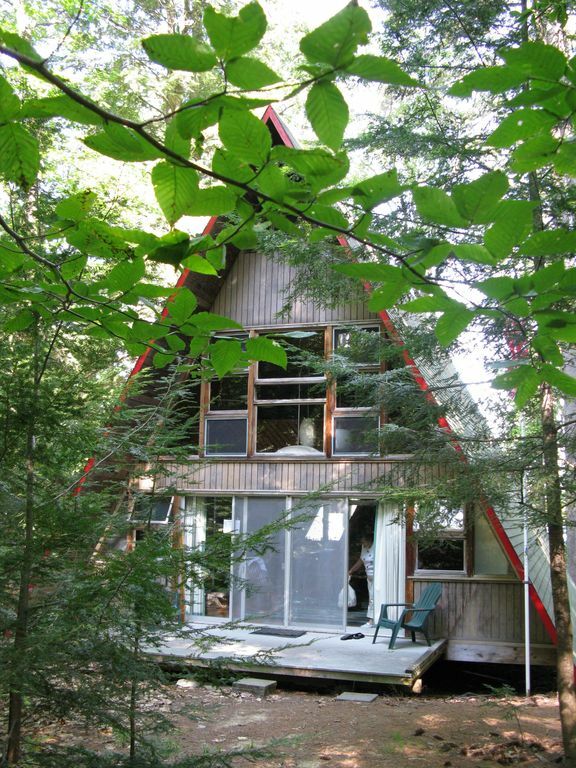 Pristine location on beautiful Squam Lake. We are on 12 acres at the END of the road, away from neighbors, with nature preserves on both sides. Plenty of sunshine, stunning lake views, dock, and sandy beach access. The town of Center Harbor is approximately 5 miles from the house.